Easier said than done, but without a doubt, this is one of the main ways that the retro teams in NBA 2K could be improved. Quite a few teams are missing key players, be it the retro squads or the All-Time teams. Contrary to what many gamers somehow still believe, this isn’t due to laziness or a lack of knowledge, but an inability to secure the likeness rights for the players in question. Therein lays the challenge: it’s not really up to 2K, who would no doubt include those players in a heartbeat. It comes down to the players agreeing to terms with 2K for the use of their likenesses, and some players aren’t interested, or decline to be involved for a number of personal reasons. Nevertheless, it’s something I hope that 2K can work towards making a reality. A few of the existing retro teams just don’t look right without key players, such as the 2004 Detroit Pistons and 2000 Portland Trail Blazers, who are missing Rasheed Wallace. The All-Time squads don’t feel complete without the likes of Charles Barkley and Reggie Miller either, and their absence also prevents several interesting teams from being included. In a nutshell, I’d like to see 2K do whatever they can to get missing players – in particular the big names, but also some of the bench players – into the games. If it means donations to the NRBPA, then come on 2K: cough up the cash! Conversely, this is something that NBA 2K does have more control over. While the retro teams do make use of the correct logos and jerseys for the era they’re from, there could stand to be a greater amount of year-specific art for their players. Many of the players who appear on a few different retro and All-Time teams share the same faces and portraits. This results in inaccuracies such as Dennis Rodman having the same portrait for both the Bulls and Pistons teams that he’s on, Ray Allen having a shaved head on the All-Time Bucks, and other anachronisms. 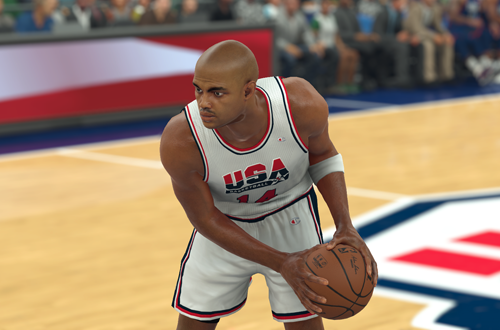 A large amount of retro players are also missing portraits in NBA 2K19, which makes them feel like an afterthought. That’s not all. The ratings, Badges, and signature animations for a lot of retro players seem to be off, as 2K has seemingly abandoned the concept of the “Hall of Fame ratings scale” that they were touting just a few short years ago. There’s also the matter of the retro teams from before the three-point era having the three-point arc on their courts. 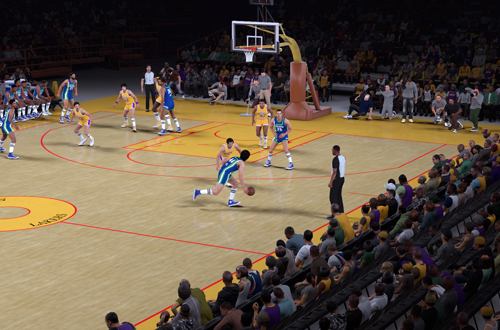 If the 50s, 60s, and 70s All-Stars in NBA Live were able to feature courts that had no three-point line and all shots counting for two, then surely NBA 2K can make it happen. The option to select rules from different eras would make playing with the retro teams a lot more fun as well. That kind of attention to detail never goes astray. 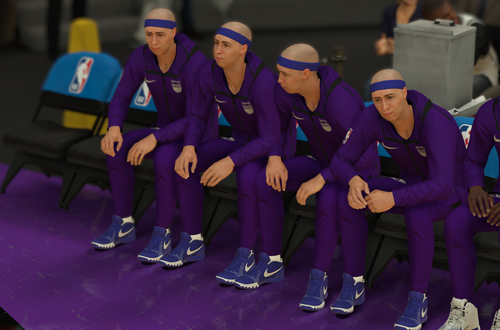 We may no longer have Roster Players standing in for current stars that retained the rights to their likenesses, but the concept lives on in the placeholder players that pad out the retro teams in NBA 2K. This is an area where NBA 2K must be careful, as various lawsuits over the years have ensured that placeholder players can’t resemble the individuals they’re standing in for. However, they could be handled a lot better than they are currently. For a start, re-using the same names and faces over and over again feels lazy. Surely, they could at least use randomised faces and names from the generated Draft Class pool, while filling in the positions of the missing players. It’s quite distracting to see multiple players with similar and even identical names on the rosters of retro teams, especially when they also have the same ratings and faces. Ideally, the placeholder players would be removed entirely, and lineup requirements changed for squads that are coded as retro teams. I’d much rather play with a retro squad that only has six or seven real players, with no fake players ever showing up during gameplay. The game already allows it – at least in Play Now – so if they can’t be made less generic, they should simply be removed. They should also never be rated higher than real players, so at the very least, their ratings should be further reduced. While I’d much prefer new retro teams to be added rather than see any removed, it is something that should be considered in future NBA 2K games. We’ve already lost a handful of teams over the years, though in most cases, there was a good reason for removing them. I do think that 2K should be judicious, not only in the teams that they add, but also the ones that they keep. It’s an issue that I’ve discussed before, but if they can’t properly represent a squad with all (or at least, most) of its key players, then it’s not a good candidate to be included; or, conversely, one that should be considered for removal. It waters down the concept if many of the teams appear to be half-done. In a similar vein, some of the retro teams could stand to be swapped with another one from around the same time period. A few of the teams – the 1998 Spurs and Lakers are good examples here – were originally included for games in the Jordan Challenge or NBA’s Greatest. They made sense there, but aren’t necessarily the best or the most interesting choices from that general era. It’s something the developers have already done, such as swapping the 1990 Pistons for their 1989 squad. It may sound like a minor nitpick, but it could result in some more interesting inclusions, and allow for match-ups between rivals with accurate rosters from the same season. Aside from licensing new players, this is the most important change to the way retro teams are handled. Sure, it’s nice simply having the teams in the game, and the retro players make for great content in MyTEAM as well. However, without a challenge mode dedicated to them, retro teams aren’t being put to full use. 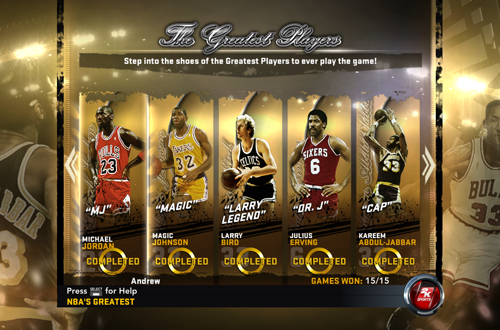 The Jordan Challenge and NBA’s Greatest were phenomenal modes, and gave us a reason to play with the throwback squads in games that mattered, because we were able to make progress towards a goal. 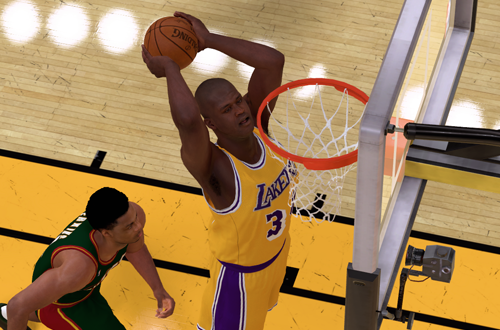 Implementing the era-specific presentation from NBA 2K12 would be the icing on the cake, but even without it, a retro team challenge mode would be great. There are a couple of reasons that the NBA 2K team may be reluctant to do this. It would take time and effort to implement, in a development cycle that’s already quite brutal. They may also question the appeal, and whether it would be worth all of their efforts, as there’s been a big backlash against NBA nostalgia in recent years. Whereas we were still celebrating past eras at the beginning of the decade, a lot of younger fans are now sneering at us “old heads” and the “plumbers and dentists” we supposedly grew up watching. At the same time, what better way to educate younger fans about the great teams and players of the past than challenging them to re-create their feats? What are some other ways to improve the retro teams in NBA 2K? How often do you play with them currently? Have your say in the comments below, and as always, feel free to take the discussion to the NLSC Forum! That’s all for this week, so thanks for checking in, have a great weekend, and please join me again next Friday for another Five. Great article! For NBA 2k13 ps3 I can write Reggie Miller in tha CAP and they appeared. It’s the any way to doit? They have to be careful about doing anything like that these days, due to all the lawsuits over likeness rights. Thanks! I got NBA 2k19 for nintenso switch for only 19$ it’s a great game!!! If I was them I put rosters of 8 players for the retro team! Assuming they could license the eight players, I’d much rather that than padding out the roster with the modern equivalent of roster players.